Flowers with fiery red petals dance on the vast green plains of Thailand inspiring Chaiya Wannalert. With birds soaring through the skies, the composition captures nature's vibrant energy. 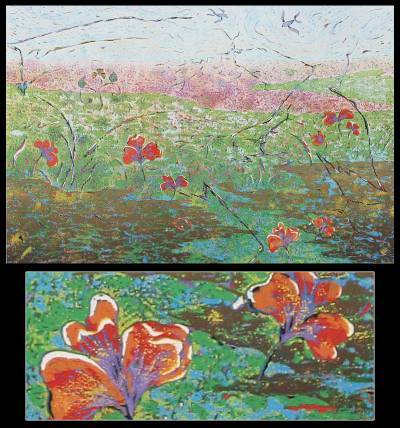 Wannalert masters woodcut printing techniques to create this colorful landscape. You can find 'time of the Memory from Nature II' (2011) by Chaiya Wannalert in paintings categories such as Landscape Paintings, Floral Paintings, Impressionist Paintings, Print Paintings and Ink Paintings. Enjoy exploring these sections for other Novica treasures.